Can We Listen to Something Else? Long car rides as a child can mean anything from an hour long trip to visit grandma to a family vacation from the Midwest down to Florida. Regardless of the distance, there tends to be two major questions children will ask during the drive: “Are we there yet?” and “Can we listen to something else?” For Aidan Hall, Landen Gruszewski, Colin McMillen and Alex Dooley, they are hoping to be that something else. Gruszewski and Hall originally met through former girlfriends and say that the band first formed on a front porch. They both played guitar and had jammed a few times together, but once both of their relationships ended, Hall had a song written that he asked Gruszewski to add to that would complement it. Despite just the two of them playing together, they never really considered themselves an acoustic duo. Hall is the main songwriter of the band, typically bringing a blueprint of a song with lyrics, melody and a rough set of chords to his bandmates before everyone adds in their own taste. Their songwriting process has taken them anywhere from a night to a week, including their recently released self-titled EP. The experience they had creating the EP was hands down the best they’ve ever had. They worked with Mooney Recordings engineer Jakob Mooney and built up a relationship with him that brought out their best. “He pushed us to be the best we could be on these songs, and has become a great friend,” Hall said. 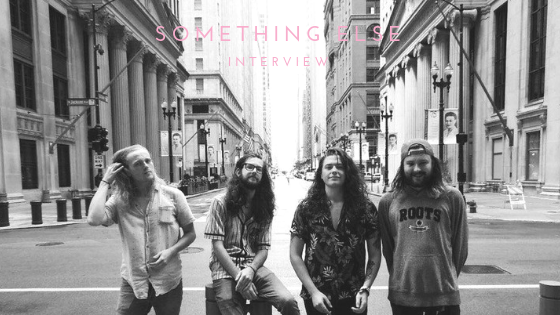 Something Else’s self-titled EP shows off a variety of sounds that give them that introspective, post/pop vibe. They hope that the EP spreads a message that it is ok and important to be honest with yourself, and once you’re able to do that, anything is possible. “Sometimes no one can tell you the truth better than you; you know yourself better than anyone so why not be true to you,” Hall said.